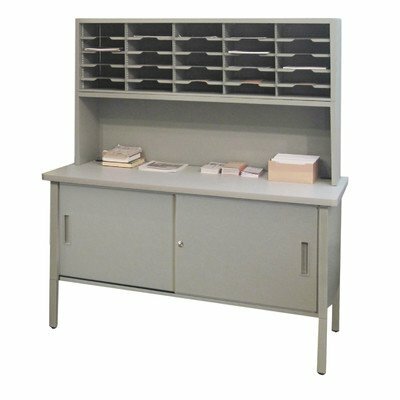 UTIL0025 Color: Gray Textured Steel/Gray Laminate Surface Features: -2 Cable management grommets included. -Literature organizer. -25 Adjustable sorter pockets. -1 - 16'' Riser with 2 cable management knockouts. -Lockable sliding doors. -Steel construction. Number Of Compartments: -25. Country of Manufacture: -United States. Product Type: -Mailroom organizer. Dimensions: -Under worksurface storage cabinet, 54W x 26D x 18H. Overall Height - Top to Bottom: -68". Overall Width - Side to Side: -60". Overall Depth - Front to Back: -30". Overall Product Weight: -260 lbs.